It wasn’t pretty, but a win is a win. Last night, the Clippers picked up their second victory in as many games with a 2-1 win over Brunswick. Charles Henry Watson ’22 was outstanding in net and his freshmen teammates, Cam Miller, Matt Robichaud, and Oliver Prinn, all played well. 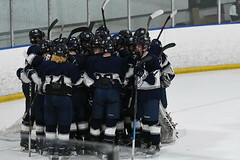 Yarmouth dominated the opening period by out-shooting Brunswick 10-4. On the penalty kill, Captain Sam Marjerison ’19 opened up the scoring with a nifty move to give the Clippers a 1-0 lead. Will Giese ’20 picked up the assist. However, with four seconds to go in the period, a defensive zone breakdown led to a power-play goal for the Dragons and the teams ended the first period tied 1-1. The Clippers seemed to go to sleep in the second and third periods as Brunswick outshot Yarmouth 11-7. But for strong net-minding from Watson, the Clippers could easily have found themselves down by a couple of goals. 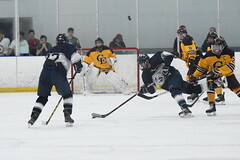 With 3:04 remaining in the game, Aidan Miller ’20 played the hero when he collected a loose puck off Will Giese’s drive to the net and ripped a shot through a double screen past the Brunswick netminder for the game-winning, power-play goal. 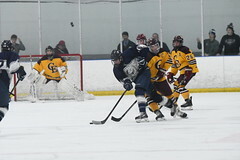 Giese was credited with his second assist of the game. Yarmouth heads to Dover, NH to take York on Saturday, December 15th for a “late brunch” game at 10:45 am.